You can always raise more money than your target. Set your public crowdfunding $ goal as low as reasonably possible to increase your chances of success, but aim high behind the scenes. It’s a good idea to have some preplanned ideas to keep up the momentum if/when your campaign surpasses the 100% mark. On Kickstarter, you can always raise more money than your target, but you can’t raise less. If you fail to hit your target (and you CANNOT change the target after the campaign is launched), your backers’ credit cards don’t get charged, you don’t get any money, and no-one gets any rewards. Game over. The same does not apply to Indiegogo (which has an option called “flexible funding” for campaigns that fail to hit their targets), but it might as well. Let’s say you need at least $5,000 to produce your project, but you don’t raise that much. Now you’ve committed to sending your backers copies of your book or album, but you don’t have sufficient funds to actually create it. This is not a quandary you want to find yourself in post-campaign. There’s a psychological positive to the %-funded bar (which is prominently displayed at the top of every campaign) sprinting rather than moseying towards 100%. The lower the $ target, the faster you approach 100%. Speed excites people. There are more joiners than pioneers in the world. In other words, the more success your campaign is perceived as having, the more positively it will be received, and the more likely people – especially prior strangers to you – will be willing to put their credit card information on the internet for you. Success breeds success. Campaign momentum is typically boosted, not halted, by surpassing the 100% funded mark. So, we’re aiming to have your campaign surpass 100% funded as quickly as possible. Sometimes this happens in the first week – or even on the first day. We also want to keep up the momentum post-100% and keep aiming for the high end of the range. Enter: Stretch Goals! 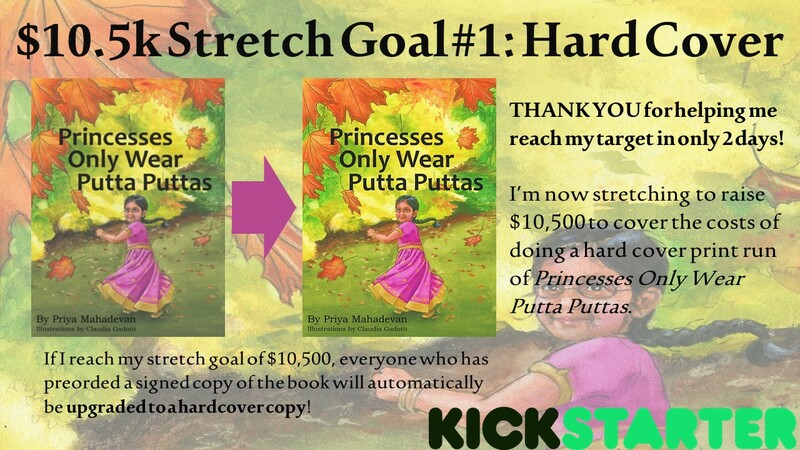 Princesses Only Wear Putta Puttas is a children’s picture book by Charlottesville chef and author Priya Mahadevan. We ran her campaign in May of 2015 to fund the professional production of her book. Priya wanted to raise $12,500 to cover the costs of publishing ebook, paperback, and hard cover versions of her manuscript, and cover book promotion. When we did her network analysis, $8,500 came in at the low end, so that is where the public target was set. This $8,500 goal was surpassed in only two days of campaign launch! So, we updated her campaign with the following image. An additional $2,000 would cover doing a full color hard cover print run of the book. As an added incentive to keep up the momentum, we promised those who pledged early to the campaign the opportunity to upgrade to the hardback if the target were passed. In fact, the first stretch goal was reached! So we updated the campaign again. 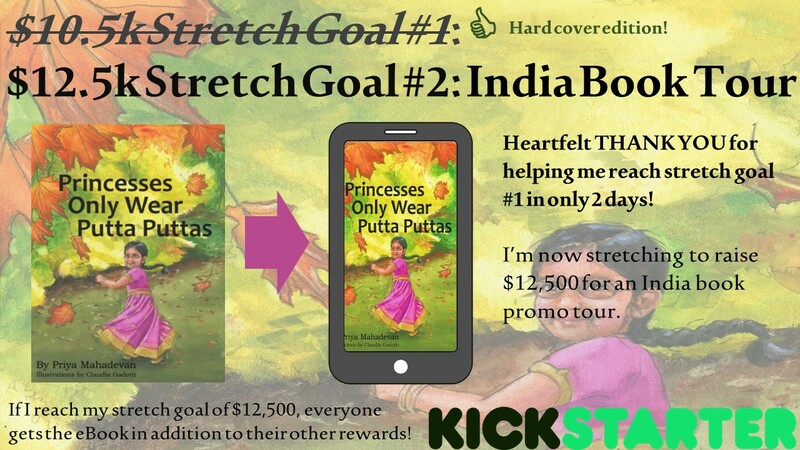 This time, another additional $2,000 would be used to promote the book in Priya’s home country, India. Again, we created an additional incentive: ALL backers would receive the ebook version in addition to the other rewards. This second Stretch Goal was also surpassed before the end of the campaign! There are a few important lessons here, in addition to the central message that Stretch Goals work. Add Stretch Goals in bite-size chunks. A realistic objective is more exciting and enticing than an implausible one. Thank your early backers. It’s important to recognize those people who helped you in the beginning, before you met your original target. They were the believers before others jumped on the bandwagon. But make your thank-you’s doable. In this sample project, we already knew how many people had pledged to the paperback version of the book, so we were not opening a black hole of expensive hard covers to deliver at the end of the campaign by allowing this limited number of people the option of an upgrade. And, once the ebook version of the book is created, it’s easy to email or Dropbox to backers. Creating a whole new perk – say, a t-shirt customized in each backer’s size – is not efficient; in a worst-case scenario, a poorly thought-out thank-you could even bankrupt your campaign. Let people know what the additional money is for. Transparency is key to trust. Trust is key to getting people to enter their credit card information onto the internet for you. Being clear about why you are raising the additional money, and what it will go towards, is essential.